For the last few years, we have heard constant predictions of a recession in Australia as the mining boom turned to bust and a housing bust was seen to follow. Some even went so far as to say that an imminent recession was “unavoidable”. Those fears intensified after the September quarter GDP data showed the economy going backwards. 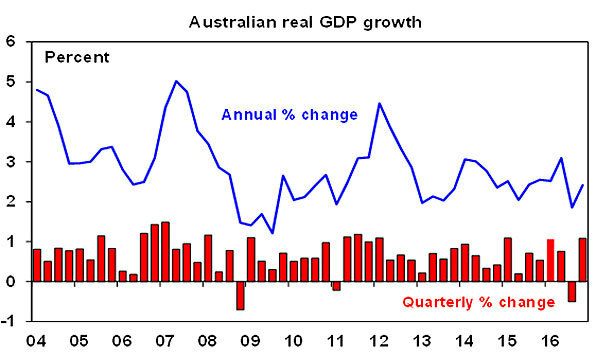 But a 1.1% rebound in December quarter growth highlights that yet again it hasn’t happened. The December quarter rebound was on the back of stronger consumer spending, housing investment, business investment, public demand and export volumes. So where to from here? There are seven reasons to be upbeat about the Australian outlook: thanks to a more flexible economy Australia is on track to take out the Netherlands for the longest period without a recession; south-east Australia is continuing to perform well; the great mining investment unwind is near the bottom; the surge in resource export volumes has more to go; national income is rising again; public investment is strong; and there are signs of life in non-mining investment. Growth is on track to return to near 3% this year. Housing construction activity is likely to peak this year, a large supply of apartments will hit various cities, affordability is poor, and household debt levels are very high. Firstly, at now 102 quarters without a recession, Australia is on track to take out the Netherland’s record of 103 quarters without a recession. This owes a bit to statistical luck, but it also reflects the benefits of the economic reforms of the 1980s and 1990s that made the economy more flexible and sensible macroeconomic management that meant that when the mining boom ended it enabled other sectors of the economy to take over in driving growth. 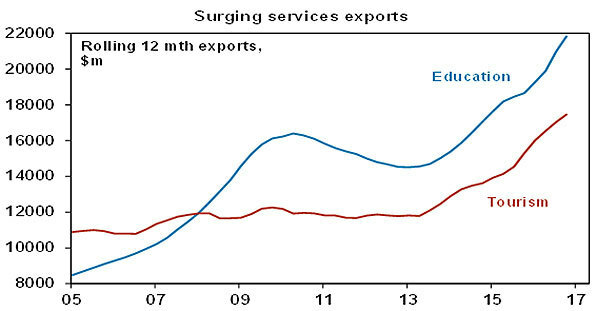 This included housing and services exports like tourism and higher education. Secondly, reflecting this, the southeastern states of NSW, Victoria and ACT are continuing to perform strongly in a reversal of the so-called two-speed economy. Thirdly, while mining investment is continuing to decline, it’s now a smaller share of the economy so its decline is having a diminishing impact and it’s nearing the bottom anyway. At its peak in 2012 it was 7% of GDP whereas its now less than half that so a 30% annual decline is having half the impact on the economy. What’s more mining investment intentions indicate that by mid next year it will have fallen back to around its long-term norm of about 1.5% of GDP. 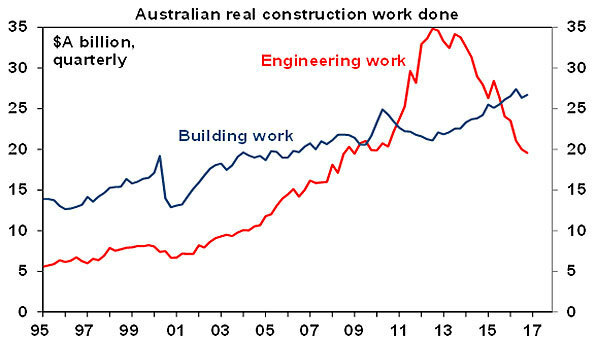 Engineering construction – which has been dominated by mining activity - has already fallen back to its long-term trend. This means a slowing in housing investment is less of a threat because it will be offset by a lessening in the detraction by falling mining investment. Fifthly, the blow to national income from the slump in commodity prices has reversed as prices for iron ore, metals and energy have rebounded. While a new commodity price boom is a long way away the rebound is pushing up national income. Amongst other things, this along with booming export volumes is leading to a dramatic shrinkage in Australia’s current account deficit which could soon be in surplus for the first time since the 1970s and the associated surge in resource company profits could knock $8-10bn p.a. off the Federal budget deficit. Sixthly, public infrastructure investment is ramping up strongly in response to state infrastructure spending particularly in NSW and the ACT much of which is financed from the privatisation of existing public assets. Finally, there are signs of life in non-mining investment. 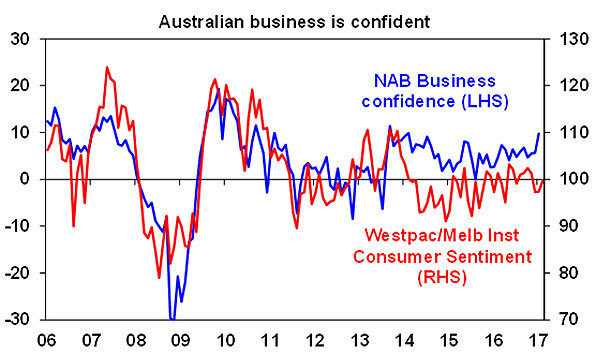 In terms of fundamental drivers borrowing costs have been low for some time but business confidence is reasonably high, profits for non-resource companies are growing around 5% per annum, and capacity utilisation is up from its lows. While mining investment plans for the financial year ahead are around 30% below such plans a year ago, plans for non-mining investment are actually up 7%. Overall, a recession is likely to continue to be avoided, and economic growth is likely on its way back to near 3% this year. The Australian December half profit reporting season confirmed a very strong return to profit growth. However, this dramatic turnaround has been driven by resources stocks with more modest growth for the rest of the market. In terms of some key statistics: 45% of companies results have exceeded earnings expectations which is around the long-term norm, 59% of companies have seen profits up from a year ago with a median gain of 4% year on year and the focus has remained on dividends with 80% of companies either increasing or maintaining their dividends which is a positive sign of corporate confidence in the outlook. 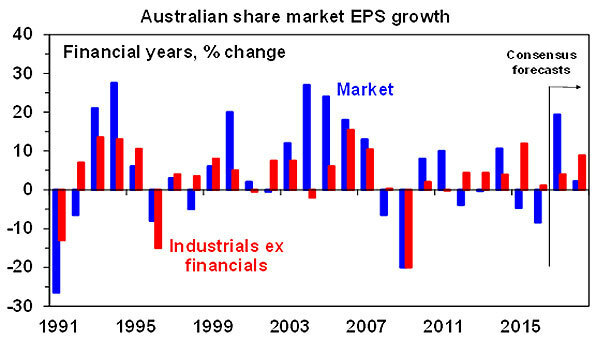 A return to reasonable growth underpinning reasonable profit growth is positive for Australian assets. With Australian shares up 12% since the US election and trading on a forward price to earnings multiple of 15.5 times which is above the long-term average, the market is vulnerable to a further short-term consolidation or correction. However, the improvement in profits – which is likely to broaden to industrials – should underpin a rising trend in the market on a 6-12 month horizon.